Evan Branscum, left, and Julie Sherrill recently received Arkansas Blue Cross and Blue Shield Primary Care Scholarships. Sept. 15, 2016 | Sept. 15, 2016 | Two medical students at the University of Arkansas for Medical Sciences (UAMS) have each been awarded a $20,000 Arkansas Blue Cross and Blue Shield Primary Care Scholarship, which encourages aspiring physicians to pursue primary care practices in rural Arkansas. Evan Branscum, a senior who grew up in Marshall, and Julie Sherrill, a junior from Dumas, are this year’s recipients. The scholarship has been presented to two UAMS College of Medicine juniors or seniors annually since 2012. Arkansas Blue Cross and Blue Shield, the state’s largest insurer, established the endowed scholarship in 2010 with a $1 million gift to the UAMS Foundation Fund. The scholarship is a part of a broad effort to produce more family medicine, general internal medicine and general pediatrics doctors for Arkansas, especially in rural areas where access to primary care is limited. More than two-thirds of Arkansas’ 75 counties include federally designated Primary Care Health Professional Shortage Areas. Primary care physician shortages are expected to increase substantially as the state’s population continues to age and require more medical care, and as more Arkansans, now insured as a result of health insurance expansion, seek primary care services. The College of Medicine has worked with private partners such as Arkansas Blue Cross and Blue Shield to increase scholarships. The high cost of medical school and the burden of educational debt that most medical students face when entering their postgraduate residency training can be a factor in choosing higher-paying specialties instead of primary care and practicing in rural areas. The average medical school debt of recent UAMS graduates who have educational debt is about $180,000. 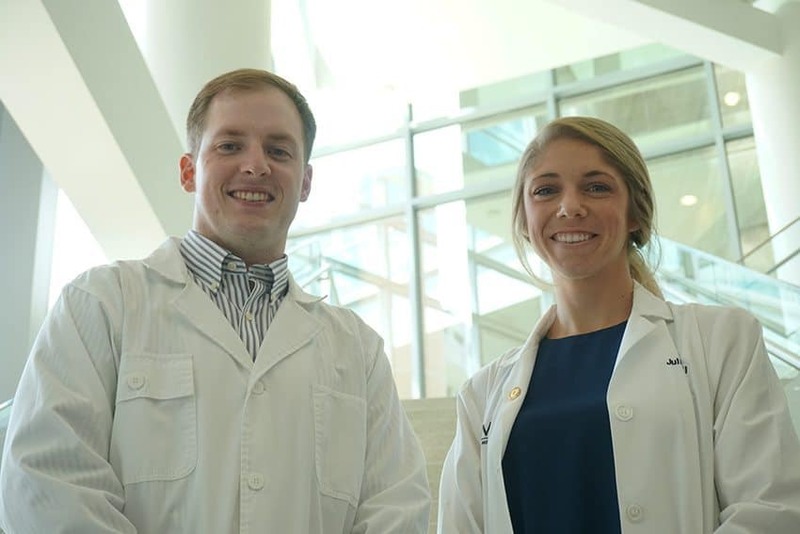 “Evan and Julie represent the spirit and commitment we want to see from our medical students to help those most in need across Arkansas, and we congratulate them as the recipients of this year’s award,” White said. Branscum graduated from Marshall High School and received his undergraduate degree at the University of Arkansas, Fayetteville. He plans to practice in north central Arkansas in or near Searcy County, where his family has lived for over four generations. Branscum shadowed and worked alongside family physicians in Marshall and Tontitown, where he was able to learn more about primary care in a rural setting. He is president of the Family Medicine Interest Group, and an active member of the Rural Medicine Student Leadership Association. Branscum has also volunteered at the UAMS 12th Street Health & Wellness Center, a student-led free clinic in Little Rock. Sherrill graduated from Dumas High School and received her undergraduate degree from the University of Arkansas, Fayetteville. She plans to pursue a career in family medicine upon graduating UAMS in 2018. Primarily, her interests are in southeast Arkansas, including both Desha and Arkansas counties. Small towns like Dumas are part of the appeal to practice there, said Sherrill. Sherrill recognizes the need that rural areas in Arkansas have for primary care. Sherrill spent time shadowing family physicians in Dumas and McGehee. Upon receiving her undergraduate degree, she spent time as an EMT with Dumas Emergency Medical Services, where she learned about listening and relating to patients in distress. “I realize I can’t save the world, but I can use my training to serve a community of people that truly needs help,” Sherrill said.